I have to admit, there are days when I just don't feel like drinking plain water, and I have a feeling I am not alone. There are tons of great water-alternative options available at the supermarket, but some of them are definitely better for you than others (and you want to make sure you are drinking a water-alternative that is as close to water as possible). I have a few personal favorites (none of which contain artificial sweeteners, caffeine, or more than 5 calories). Today I am going to recommend two things: (1) making your own flavored water and (2) for those of you that are busy, a great alternative called Hint Water, since it is very close to the taste of making your own. Making your own flavored water is really easy! You just need a pitcher full of water, and some fresh fruit or vegetables. I've soaked a lot of different fruits (and veggies) in my water: blueberries, strawberries, oranges, lemons, lime, and cucumber. After you add your fruit or fruits (combining multiple fruits is both fun and tasty), refrigerate the water for a few hours to let the fruit flavor blend into the water, and then you are good to go until the pitcher runs out, at which point you can usually add more water to the same set of fruit (if you drank the water quickly). If you are too busy to make your own naturally flavored water, I have to say Hint water is a very close substitute. The fruit flavor is very subtle, but yummy enough to help me easily drink my 8 cups of water per day. I really like drinking Hint water when it is refrigerated versus warm. 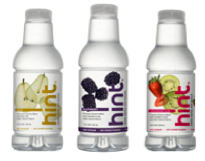 Hint water comes in a ton of flavors (you can check out the Hint website to see a complete list) of which my personal favorites are pear and strawberry kiwi. You can buy fruits and a pitcher for making your own water at almost any grocery store. You can buy Hint water at Whole Foods (with the refrigerated drinks) as well as at Jamba Juice, and at the Yummy Diet Food Amazon Store. What fruits do you like to put in your water? I actually sampled a new, low-calorie water called Sonu the other day at my local deli. I tried the blueberry/pear flavor and was pleasantly surprised. It was really good and, like hint, uses no artificial sweeteners. I did a little research on Sonu when i got home (www.sonuwater.com) and found out it was organic, and enhanced with both vitamins and electrolytes. I really recommend trying it!